Ernie's Blog: What's Wrong Here? I logged on to print my boarding passes to come home from Thanksgiving, and found this picture gracing the front page of Southwest's site. Seems they have a new plane, co-branded with the NBA. 1. I don't know, or care, who these people are. 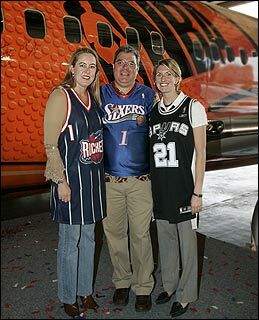 (Clicking on the story, tells you they're part of Southwest's sports marketing department.) They're meaningless to anyone outside the corporation, though the story might not be. 2. In a rush to name a plane something very "basketball," they've chosen to christen the thing "Slam Dunk One." Don't know about you, but the image of a slam dunk doesn't exactly coincide with my personal vision of quality air travel. If you're talking to yourself, you're not talking to customers. Absolutely. Call it the "Swoosh". Actually, Nike would have something to say about that. Call it the "Sky Hook". Behold... I give you "Airball 1"
Man, they were doing so well. First laugh-out-loud blog entry I've read today! Speaking of Nike, maybe an Air Jordan would have been a better tie in? I do have to say that I love the idea of wrapped planes vs. the old ugly orange and tan or orange and blue planes. How about a Scooby Doo or Disney plane?! THAT would be fun to spot at the local airport!